The 2012 World Series was the 108th edition of Major League Baseball's championship series. The San Francisco Giants, the National League champions, won the best-of-seven playoff in a 4-game sweep over the American League champions Detroit Tigers. This marked the Giants' seventh World Series title in franchise history, their second in San Francisco (they won five in New York), and their second in a three-year period (2010–2012). Their World Series sweep was the first by a National League team since the Cincinnati Reds swept the Oakland Athletics in the 1990 series and the first NL sweep not by the Reds since 1963, when the Los Angeles Dodgers swept the New York Yankees. The Giants' Pablo Sandoval, who in Game 1 tied a record by hitting three home runs in one World Series game, two off of Tigers' ace Justin Verlander, was named the World Series Most Valuable Player (MVP). The San Francisco Giants held home field advantage for the best-of-seven World Series: San Francisco hosted Games 1 and 2, and would have hosted Games 6 and 7 if these had been necessary to decide the Series. The 2012 series began on Wednesday, October 24, at AT&T Park in San Francisco, California and ended on Sunday, October 28, at Comerica Park in Detroit, Michigan, with the conclusion of the fourth game. The Tigers entered Game 1 in San Francisco, six days after sweeping the Yankees in the American League Championship Series. Two days before Game 1, the Giants had taken the National League Championship from the St. Louis Cardinals, the defending World Series champions, at home in San Francisco, after winning Game 7 of the National League Championship Series. In accordance with the standard since 2003, the outcome of the All-Star Game decided whether the American or National League would hold home field advantage in the World Series. The National League All-Star Team won the 2012 All-Star Game, played on July 10 in Kansas City, Missouri, by a score of 8–0. Representatives of both the Giants and the Tigers played key roles in the outcome. Giant players scored and/or drove in seven of the NL All-Star team's eight runs. The NL scored five runs in the first, all yielded by a Tiger, ace Justin Verlander.Pablo Sandoval would hit a triple, and Melky Cabrera who would wind up winning the All-Star Game MVP hit a homerun during the game. The Giants' Buster Posey was the league batting champion. The Giants finished the regular season atop the National League West with 94 wins and 68 losses, eight games ahead of the second place Los Angeles Dodgers. They defeated the Cincinnati Reds in the National League Division Series, a best-of-five series, in five games. They then defeated the defending 2011 World Series champions, the St. Louis Cardinals, in a seven-game series to capture the National League pennant. The manner in which the Giants defeated the Reds and then the Cardinals created some historical firsts. Because of the addition of a wildcard game, the National League Division Series between the Giants and Reds began with two games in San Francisco. Cincinnati, who posted a better won-lost record than the Giants, hosted the final three games. The Giants lost the first two games at home in San Francisco, yet won the last three on the road. The Giants became the first major league team to win three straight road games in a best-of-five playoff series after losing the first two games at home. In the second round of the playoffs, the National League Championship Series, they came back from a three-games-to-one deficit to defeat the St. Louis Cardinals. Through this playoff course, the 2012 Giants became the first National League team and the second team in American major league baseball history (after the 1985 Kansas City Royals) to win six consecutive playoff games in which they had faced elimination. This was the Giants' twenty-second NL pennant overall, their fifth as the San Francisco Giants. Their World Series berth was their second in three years (since 2010, when they defeated the Texas Rangers in five games). San Francisco's notable preseason acquisitions were outfielders Melky Cabrera and Ángel Pagán. Cabrera set the Giants' franchise record for hits in the month of May, with 51, and Pagán set the San Francisco Giants record for triples in a season, with 15. On August 15, Major League Baseball meted a fifty-game suspension upon Cabrera for his use of a banned substance. At the time, his 159 hits led both leagues, his .346 batting average measured second in the NL, and he had received the 2012 All-Star Game MVP. The suspension expired after the NLDS, but the Giants opted not to add him to the team's NLCS or World Series rosters. 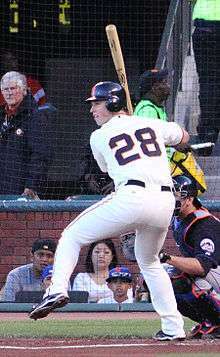 All-Star Buster Posey finished the regular season with a .336 batting average to win the 2012 NL batting championship. In the World Series, he would go on to catch every inning, including complete game shutouts in Game 2 and Game 3. He would homer in Game 4. He would, in the World Series, not allow any baserunners to advance by either passed ball, stolen base, or wild pitch. He would begin a double play in Game 1 and execute an important tag play in Game 2. Earlier in the regular season, starting pitcher Matt Cain threw the first perfect game in Giants history, and the twenty-second in American major league history, on June 13. He would start Game 4 of the World Series, which the Giants would win to clinch. Relief pitcher Sergio Romo contributed to team success by converting 14 out of 15 save opportunities after an injury sidelined closer Brian Wilson a few days after the season began. Romo would convert three saves in the World Series, including the Game 4 clincher, which would end with Romo striking out the 2012 American League MVP. Midseason addition Marco Scutaro ended the regular season with a .306 batting average and a 20-game hitting streak. In October, Scutaro tied a League Championship Series record with 14 hits (and a .500 average) against the Cardinals, and he received the NLCS MVP. In the World Series, his Game 4 tenth-inning single drove home a run that gave the Giants a lead the team would not relinquish. Bruce Bochy made his third World Series appearance as a manager, his second with the Giants. Bochy led San Francisco to the 2010 title. Before that, he led the 1998 San Diego Padres to the World Series, where the New York Yankees swept. Bochy would win his second World Series title. Bochy's starting rotation for the 2012 World Series: Barry Zito in Game 1, Madison Bumgarner in Game 2, Ryan Vogelsong in Game 3 and Matt Cain in Game 4. The Tigers' Miguel Cabrera won the Triple Crown. The Tigers finished the regular season atop the American League Central, with 88 wins and 74 losses. The Tigers repeated as champions of this division, having also won it in 2011. This was their first repeat title in the divisional-play era (i.e., since 1969). The last time, before 2011–2012, that the Tigers franchise had made consecutive playoff appearances was 1934–1935. The Tigers defeated the Oakland Athletics in the American League Division Series three games to two. The Tigers then captured their eleventh American League pennant, sweeping the New York Yankees four games to none in the American League Championship Series. This World Series berth was their first since 2006, when the St. Louis Cardinals defeated them four games to one. The 2012 Tigers became the fourth team to accomplish a four-game sweep in an ALCS. The three other teams to do so (1988 Oakland A's, 1990 Oakland A's, and 2006 Detroit Tigers) did not win the World Series, and the 2012 Tigers would, in the 2012 World Series, continue this trend. Pitcher Justin Verlander (17–8) led the American League in strikeouts with 239. Max Scherzer (16–7) finished second in the AL with 231 strikeouts. During the 2012 season, pitcher Doug Fister set an AL record by striking out nine consecutive batters. Miguel Cabrera became the first player in 45 years (since Carl Yastrzemski in 1967) to win the Triple Crown. 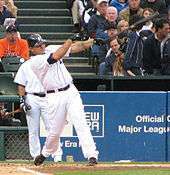 Miguel Cabrera compiled a .330 average, hit 44 home runs, and had 139 RBIs, all of which led the American League. In the 2012 ALCS, Cabrera extended his hitting streak in LCS games to 17, a major league LCS record. (Cabrera made ten hits in seven games with the Florida Marlins in the 2003 NLCS, eight hits in six games with the Tigers in the 2011 ALCS, and five hits in the Tigers' 2012 ALCS sweep). As of 2012, Miguel Cabrera has played in exactly 17 LCS games. Miguel Cabrera would compile a .231 batting average for, and make the last out of, the 2012 World Series. In January 2012, prior to the start of the season, the Tigers signed first baseman Prince Fielder to a nine-year, $214 million contract. In the 2012 World Series, Prince Fielder would manage only one hit, a single, in 14 at-bats. Manager Jim Leyland made his third trip to the World Series, and his second with the Tigers (he also managed them in 2006). He managed the 1997 Florida Marlins to a seven-game victory in the World Series. Leyland's starting rotation for the 2012 World Series: Verlander in Game 1, Doug Fister in Game 2, Aníbal Sánchez in Game 3, and Scherzer in Game 4. In Game 1 of the World Series, Verlander would not fare much better against Giant bats than he had in the All-Star Game; allowing five earned runs in four innings. The Giants' Pablo Sandoval was named the MVP of the series after hitting .500 with three home runs. Gerry Davis, as senior umpire, served as crew chief for the six-man crew. With his work in this Series, Davis set a new record for postseason games umpired in American major league history, with 115. Fellow regular-season crew chiefs Brian Gorman and Joe West assisted Davis, along with Fieldin Culbreth, Dan Iassogna and Brian O'Nora. The Giants' Pablo Sandoval hit three home runs in Game 1. The Giants jumped out to a 6–0 lead, scoring in four of the first five innings of Game 1, en route to an 8–3 victory. Pablo Sandoval went four-for-four. He drove in four runs on three home runs. He joined Babe Ruth (in 1926 and 1928), Reggie Jackson (in 1977) and Albert Pujols (in 2011) as the only players to ever hit three home runs in one World Series game. Sandoval became the first player to hit three homers in Game 1 of a World Series, and the first one to homer in his first three plate appearances. Tigers' ace pitcher Justin Verlander lasted only four innings, giving up five Giant runs. Sandoval's first two homers came off Verlander. San Francisco starting pitcher Barry Zito allowed only one run in 5 2⁄3 innings, and drove in a run with a fourth-inning hit. The Giants scored their final two runs in the seventh inning off Tiger relief pitcher José Valverde, who failed to convert saves in previous stages of the postseason. In the top of the ninth, Jhonny Peralta hit a two-run home run off George Kontos to cut the lead to 8-3 but Jeremy Affeldt came in relief of Kontos and got Ramon Santiago to ground out for the final out of the game to seal game 1 and a 1-0 series lead. After Zito allowed a run on three hits in the sixth inning, Tim Lincecum relieved him. Lincecum pitched 2 1⁄3 perfect innings, striking out five. Three Cy Young Award winners (Lincecum, Verlander and Zito) pitched in Game 1, the first time this has happened since Game 3 of the 1983 World Series, when Jim Palmer relieved Mike Flanagan, in a contest against Steve Carlton. A shutout win in Game 2 gave the Giants a two games to none lead in the Series. In the top of the second, with Prince Fielder on first, Delmon Young lined a double into the left field corner. Tiger third base coach Gene Lamont waved Fielder home, but with accurate throws by left-fielder Gregor Blanco and second baseman Marco Scutaro, catcher Buster Posey tagged out Fielder in a close play at the plate. In the bottom of the second, Doug Fister was struck in the head by a Blanco line drive but stayed in the game, pitching out of a bases-loaded jam. Game 2 remained scoreless until the bottom of the seventh. Hunter Pence led off with a single, Brandon Belt drew a walk, then Blanco executed a perfect bunt down the third base line. The ball came to rest just fair, halfway between third base and home, allowing Blanco to reach safely while both runners advanced. With the bases loaded and nobody out, Brandon Crawford grounded into a double play, scoring Hunter Pence. In the eighth, with the bases loaded and one out, Pence hit a sacrifice fly to right field, scoring Ángel Pagán with the second and final Giant run of the game. Madison Bumgarner pitched seven shutout innings, yielding only two hits and striking out eight, for the win. The Giants' 2–0 victory in Game 3 was the team's second straight shutout. Matching the 2010 Giants team that also recorded two shutouts in the World Series, San Francisco became the first team since the 1966 Baltimore Orioles to record back-to-back World Series shutouts. (The 1966 Orioles, who threw three straight shutouts in Games 2–4, also swept the World Series, defeating the Los Angeles Dodgers.) The 2012 Giants became the first NL team to do so since the 1919 Cincinnati Reds, who threw back-to-back shutouts against the Chicago White Sox. These were the first back-to-back postseason shutouts for the franchise since 1917, where the New York Giants ultimately lost to the Chicago White Sox. The only runs of the game came in the Giant half of the second inning. A one-out triple off the bat of Gregor Blanco scored Hunter Pence from third. A two-out single by Brandon Crawford then scored Blanco. San Francisco starter Ryan Vogelsong pitched 5 2⁄3 shutout innings. Detroit loaded the bases with one out in the fifth inning. Vogelsong struck out Quintin Berry. Then, Vogelsong threw a pitch near the hands of the next batter, Miguel Cabrera, which induced a pop fly to end the inning. As in Game 1, Tim Lincecum relieved the Giants' starter, and pitched 2 1⁄3 scoreless innings. As in Game 2, Sergio Romo converted a save, his second of three in the Series. Game 4 extended into extra innings. Marco Scutaro's RBI single in the top of the tenth, which allowed Ryan Theriot to score, proved the difference in the Giants' 4–3 victory. With the Game 4 victory, the Giants took the 2012 World Series, four games to none. San Francisco scored the first run of the game, in the top of the second inning. With one out, Brandon Belt tripled off starter Max Scherzer to right field, scoring Hunter Pence. The Tiger defense then corralled Belt at third. In the third inning, Detroit took its first lead in any series game. Miguel Cabrera hit a high fly ball off Matt Cain towards right field, Hunter Pence had a chance to catch it but a strong wind drifted the ball out for a two-run home run. The shot snapped what was a 20-inning scoreless streak for the Tigers. The Giants regained the lead in the sixth inning, with a two-run home run, off the bat of Buster Posey. Posey's shot stayed just inside the left-field pole as it carried out. In the bottom of the same inning, Delmon Young tied the game with a solo home run, off of Giant pitcher Matt Cain, that landed over the fence in right-center. Strong relief pitching sent the game into extra innings. After a leadoff walk in the bottom of the eighth, Giant pitcher Jeremy Affeldt struck out the heart of the Tigers batting order. In the top of the ninth, Tiger pitcher Phil Coke struck out three consecutive Giant batters. Coke set a World Series record by striking out seven consecutive batters, dating back to his appearances in Games 2 and 3. Affeldt and Santiago Casilla combined for a scoreless bottom of the ninth. In the top of the 10th, Ryan Theriot ended Coke's strikeout streak, leading off with a single to right. A sacrifice bunt by Brandon Crawford moved Theriot to second. Ángel Pagán struck out. Then Scutaro served a single in front of center-fielder Austin Jackson, which scored the decisive run. Closer Sergio Romo struck out the side in the bottom of the 10th. The Series ended with Umpire Brian O'Nora calling a third strike on Miguel Cabrera. After throwing Cabrera several consecutive sliders, Romo threw a fastball that backed into Cabrera's zone, which may have surprised the batter. Because they won the Series away from their home field, the Giants accepted the World Series Championship Trophy and the World Series MVP award in their locker-room. (Incidentally, the franchise clinched its last four World Series victories away from home.). Of note in this game was the fact that it was played during heavy winds, and a swirling rain for a good portion of the evening. The city of Detroit was feeling the effects of the outer bands of Hurricane Sandy, which would hit several hours later on the North Eastern Atlantic Coast. In the United States, Fox televised the games, with Joe Buck calling play-by-play in his 15th World Series, and Tim McCarver handling color commentary for his 23rd World Series. Ken Rosenthal also appeared on the Fox telecasts as a field reporter, with Erin Andrews and Chris Myers joining him for select games. MLB International syndicated its own telecast of the series, with announcers Gary Thorne and Rick Sutcliffe, to various networks outside the U.S. Additionally, the American Forces Network and Canadian Forces Radio and Television carried the games to U.S. and Canadian service personnel stationed around the globe. Fox Deportes carried the Series in Spanish on American cable and satellite TV. However, on August 24, Tribune removed Fox-affiliate WTIC-TV from Cablevision systems in Connecticut, causing viewers to miss Games 1 and 2 of the series. An agreement between Cablevision and Tribune was reached on October 26, the day before Game 3. According to Nielsen Media Research, the four-game series on Fox averaged a record-low 7.6 rating and 12 share. The previous low was an 8.4 rating for both the 2008 and the 2010 World Series, which each went five games. The 6.1 rating in Game 3 matched the lowest rating for any World Series game with Game 3 in 2008; that year, a rain delay moved the start of the game to after 10 p.m. on the East Coast with the game not ending until 1:47 a.m. Hurricane Sandy contributed to the low amount of viewers as most residents on the East Coast were preparing for the storm's arrival during the series. ESPN Radio broadcast the World Series nationally, with Dan Shulman and Orel Hershiser working their second consecutive World Series together. ESPN Deportes Radio aired the Series for Spanish language listeners, with Ernesto Jerez and Guillermo Celis announcing. The Tigers became only the third team to be swept in the World Series after sweeping the League Championship Series (LCS), joining the 1990 Oakland Athletics and the 2007 Colorado Rockies with this distinction. For the fourth time since 1985, when the MLB postseason expanded the LCS to a best of 7, the World Series saw a team who swept its LCS face a team who won a LCS Game 7. The previous three times, 1988, 2006, and 2007, the Game 7 pennant-winner prevailed. This trend continued in 2012. The 2012 World Series was the first since 1954 to feature the batting champions from each league, Buster Posey of the Giants and Miguel Cabrera of the Tigers. (The 1954 Series showcased Willie Mays of the New York Giants and Bobby Ávila of the Cleveland Indians). Cabrera and Posey had been voted the MVP of their respective leagues (announced and awarded, as usual, after the World Series), making this the first World Series since 1988 to feature both league MVPs. (1988 saw the Oakland Athletics' Jose Canseco and the Los Angeles Dodgers' Kirk Gibson meet). The Giants became the first team since the 1966 Baltimore Orioles and the first NL team since the 1919 Cincinnati Reds to achieve consecutive shutouts in the World Series. Giants' pitching held the Tigers to a .159 batting average in the Series, the 3rd lowest for a team all-time in the World Series, behind the Los Angeles Dodgers hitting .142 against the Orioles in the 1966 World Series and the Baltimore Orioles hitting .146 against the New York Mets in the 1969 World Series. With the Giants winning Game 4 in extra innings to win the series, they became the eighth team to win a World Series clinching game in extra innings and the first to do so since the 1997 Florida (now Miami) Marlins clinched the series in Game 7 in the 11 innings. They were the first Giants team to do so since game 5 of the 1933 World Series against the Washington Senators (now Minnesota Twins) in Washington when the Giants were in New York. After sweeping this series 4-0, Bruce Bochy became the fourth World Series Manager to be on a winning side and losing side of a sweep, having lost in a four-game sweep against the New York Yankees as the San Diego Padres manager in 1998. Miller Huggins, Walter Alston and Tony La Russa were the other three. An estimated crowd of over 1 million people attended a Halloween-day victory parade along Market Street in San Francisco. The Giants failed to defend their World Series championship in 2013. San Francisco led the National League West early in the season, but critical injuries (including the loss of Pagan for three months) and subpar play on both ends doomed the Giants. They were eliminated from the playoff race on September 11, 2013, becoming the second defending World Series champion in three years to not make the postseason, after the 2011 Giants. In 2014, the Giants would, again, win the World Series and thereby continue their even-years streak of pennants and World Championships (2010, 2012, and 2014) . The Tigers would win the American League Central division championship for the fourth straight season in 2014, marking the first season since 1909 that the Tigers won three consecutive regular season pennants. The Tigers lost the 2013 ALCS to the eventual champions Boston Red Sox in six games. In 2014, they lost the ALDS to the Baltimore Orioles. ↑ "2012 World Series". Baseball-Reference. Retrieved January 6, 2014. ↑ From 1969 to 1984, the league championship series were best of five in a "2–3" format. From 1995 to 1997, MLB scheduled each division series in a "2–3" format, then switched to a "2–2–1" format in 1998. ↑ "Arizona Diamondbacks vs. San Francisco Giants – Recap – May 29, 2012 – ESPN". ESPN.com. May 29, 2012. Retrieved September 2, 2012. ↑ Mccauley, Janie (May 31, 2012). "Kennedy outduels Lincecum to end long skid – Yahoo! Sports". Yahoo! Sports. Retrieved September 2, 2012. ↑ "MLB.com Stats". MLB.com. Major League Baseball. Retrieved October 30, 2012. ↑ McCauley, Janie (August 15, 2012). "Giants OF Cabrera suspended for positive drug test". Boston Globe. Associated Press. Retrieved August 15, 2012. ↑ Lacques, Gabe (August 15, 2012). "Melky Cabrera suspended 50 games for testosterone". USA Today. Archived from the original on August 15, 2012. ↑ "Melky Cabrera suspended 50 games". ESPN.com. August 15, 2012. Archived from the original on August 15, 2012. ↑ "Melky delivers, earns All-Star MVP honors". MLB.com. July 11, 2012. Retrieved July 11, 2012. ↑ Miller, Scott (October 23, 2012). "Verlander's All-Star exhibition, exiled Melky's heroics tilt World Series home-field advantage". CBS Sports. 1 2 3 "Detroit Tigers at San Francisco Giants – October 25, 2012 | MLB.com Play-by-Play". MLB.com. October 25, 2012. Retrieved October 25, 2012. 1 2 "San Francisco Giants at Detroit Tigers – October 27, 2012 | MLB.com Play-by-Play". MLB.com. October 27, 2012. Retrieved October 27, 2012. 1 2 3 4 5 6 "San Francisco Giants at Detroit Tigers – October 28, 2012 | MLB.com Play-by-Play". MLB.com. October 28, 2012. Retrieved October 28, 2012. 1 2 "Baseball-Reference.com, Postseason, 2012, World Series". Sports Reference LLC. Retrieved March 16, 2013. 1 2 3 "Detroit Tigers at San Francisco Giants – October 24, 2012 | MLB.com Play-by-Play". MLB.com. October 24, 2012. Retrieved October 24, 2012. ↑ "Houston Astros vs. San Francisco Giants – Recap – June 13, 2012 – ESPN". ESPN.com. June 13, 2012. Retrieved June 13, 2012. ↑ Moore, David Leon (October 23, 2012). "Next big stage for Barry Zito: World Series". USA Today Sports. ↑ Beck, Jason. "Party to the Max: Tigers sweep way to Series". Retrieved October 19, 2012. ↑ "AL Strikeout Leaders". CBS Sports. Retrieved October 19, 2012. ↑ Odoardi, Anthony (September 27, 2012). "Fister sets AL strikeout mark against Royals". MLB.com. Tigers.MLB.com. ↑ "Miggy secures first Triple Crown since 1967". MLB.com. October 3, 2012. ↑ "2012 ALCS Game 4 Recap". CBS Sports. October 18, 2012. ↑ Brown, Tim (October 29, 2012). "Tigers, Verlander lament five-day layoff that stalled their momentum going into the World Series". Yahoo! Sports. Retrieved October 29, 2012. And after five days passed between their ALCS sweep of the New York Yankees and their World Series date with the Giants, they again were flat and meek. ↑ "Prince, Tigers reportedly reach nine-year deal". MLB.com. January 24, 2012. ↑ Hagen, Paul (October 26, 2012). "Facing uphill climb, Tigers 'pumped' to return home". MLB.com. Major League Baseball. Retrieved October 26, 2012. ↑ "Two Column Box Score:Detroit vs. San Francisco – October 24, 2012". MLB.com. October 24, 2012. Retrieved October 24, 2012. ↑ "Two Column Box Score:Detroit vs. San Francisco – October 25, 2012". MLB.com. October 25, 2012. Retrieved October 25, 2012. ↑ "Two Column Box Score:San Francisco vs. Detroit – October 27, 2012". MLB.com. October 27, 2012. Retrieved October 27, 2012. ↑ "Two Column Box Score:San Francisco vs. Detroit – October 28, 2012". MLB.com. October 28, 2012. Retrieved October 28, 2012. ↑ Brown, David (October 29, 2012). "Most Valuable Panda! Pablo Sandoval named World Series MVP". Yahoo! Sports. Retrieved October 29, 2012. ↑ "MLB Announces 2012 World Series Umpires". MLB.com. October 23, 2012. Retrieved October 25, 2012. 1 2 Fiammetta, Mike; Kaplan, Jake (October 25, 2012). "Did you know? World Series Game 1: SF 8, DET 3". MLB.com. Retrieved October 25, 2012. ↑ "Tigers 3 Giants 8". ESPN. October 24, 2012. Retrieved November 7, 2012. ↑ "Tigers 0 Giants 2". ESPN. October 25, 2012. Retrieved November 7, 2012. ↑ Nightengale, Bob (October 28, 2012). "Nightengale: Giant mismatch of a World Series nears end". USA Today Sports. Retrieved October 28, 2012. The last National League team to record back-to-back World Series shutouts? Would you believe the 1919 Cincinnati Reds, and that World Series was fixed. ↑ Schulman, Henry (October 27, 2012). "Ryan Vogelsong pitches SF Giants to brink of a World Series title". San Francisco Chronicle. Retrieved November 3, 2012. The Giants won their second consecutive 2-0 game, the franchise’s first successive shutouts in a single postseason since Ferdie Schupp and Rube Benton skunked the White Sox on back-to-back days in the 1917 World Series. ↑ "Giants 2 Tigers 0". ESPN. October 27, 2012. Retrieved November 7, 2012. 1 2 "Giants top Tigers in 10th for World Series sweep". ESPN.com. Associated Press. October 28, 2012. Archived from the original on October 29, 2012. ↑ Cassidy, Jack (October 29, 2012). "Phil Coke sets Tigers, MLB records in World Series". SBNation Detroit. Retrieved October 30, 2012. ↑ "Giants 4 Tigers 3". ESPN. October 28, 2012. Retrieved November 7, 2012. ↑ "Giants sweep Tigers for World Series title". USA Today. October 28, 2012. Retrieved November 7, 2012. ↑ Ortiz, Jorge L. (November 26, 2012). "Record postseason shares of $377K for Giants, Melky". USA Today. Retrieved November 27, 2012. ↑ "Less is More With MLB International". A Rouge's Point. October 19, 2012. ↑ Block, Alex Ben (October 27, 2012). "Tribune-Cablevision Deal Ends Blackout in New York Tri-State Area". The Hollywood Reporter. Retrieved February 20, 2013. has finally been settled after an acrimonious two months of negotiations. ↑ "World Series has record-low rating". ESPN.com. Associated Press. October 29, 2012. Retrieved October 30, 2012. ↑ LefKow, Mike (October 23, 2012). "San Francisco Giants have history on their side". San Jose Mercury News. Archived from the original on October 29, 2012. ↑ Shea, John (October 24, 2012). "Overheard at World Series Game 1". San Francisco Chronicle. Retrieved October 25, 2012. 1 2 "Baseball-Reference.com, Awards, MVPs & Cy Youngs". Sports Reference LLC. Retrieved March 16, 2013. 1 2 "Baseball-Reference.com, Postseason". Sports Reference LLC. Retrieved March 16, 2013. ↑ "Giants beat Tigers 2–0, take 3–0 lead in WS". usnews.com. Associated Press. October 27, 2012. Archived from the original on October 29, 2012. ↑ "2012 World Series Game 4 recap". CBS Sports. October 29, 2012. ↑ Bulwa, Demian; Fagan, Kevin (November 1, 2012). "Huge turnout for Giants parade up Market". San Francisco Chronicle.